The Apple In-Ear Headphones with Remote and Mic are engineered for superior acoustic accuracy, balance, and clarity. So you hear details you’ve been missing with other, lesser headphones. And the biggest breakthrough? They’re just $79. Two dedicated drivers in each earpiece provide incredibly accurate, balanced and detailed sound across the entire sonic spectrum. 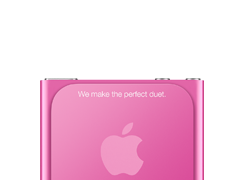 The remote and mic are supported only by iPod nano (4th generation and later), iPod classic (120/160GB), iPod touch (2nd generation and later), iPhone 3GS, iPhone 4, and iPad. The remote is supported by iPod shuffle (3rd generation and later). Audio is supported by all iPod models. Apple In-Ear Headphones with Remote and Mic require software version 2.0.1 for iPod classic (120GB), 1.0.3 for iPod nano (4th generation), and 2.2 for iPod touch (2nd generation). At home. At work. And anyplace in between. Free iPod engraving. Only from the Apple Online Store. Shop Apple Online Store or call 1-800-MY-APPLE.